Following Gas Safety Week last month, Stephanie Trotter, OBE, President and Director of CO-Gas Safety participated in a charity mountain climb. 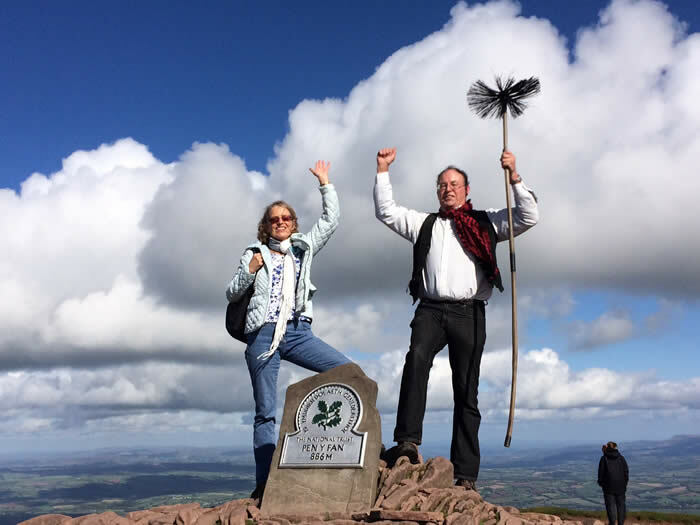 On Saturday 4th October 30 people walked to the top of south Wales’s tallest mountain, Pen-Y-Fan an 886m mountain situated in the Brecon Beacons National Park in south Wales. . This included two 20 month olds, (well they were carried for some of it!) a five year old and a seven year old. The walk was aimed to raise awareness of carbon monoxide and was organised by a girl who lost her sister last year to the carbon monoxide poisoning. She and all of her family wish to raise awareness so no other family has to go through what they are going through right now. There will be many more events in the future. Thanks to the huge efforts by friends and family £1,000 was raised for the charity. Mark Aylett, a chimney sweep from Loughborough and member of the Guild of Master Sweeps did the walk in costume after driving three hours to reach the start and another three hours back afterwards. Here they are at the peak. Stephanie on the left and Mark in full costume on the right. Around £1,000 was very kindly raised for CO-Gas Safety.